Reduced from $210.00! Certificate of Authenticity included. Double row band ring in 10K Yellow Gold featuring 3/4ctw of Natural Champagne Diamonds in a low profile style. Looks like more than 3/4ctw on the hand. Minor surface scratches on the band consistent with normal wear of a pre-owned piece. 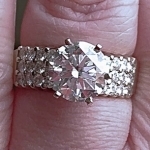 The Champagne diamonds are untreated, eye clean and very sparkly with lots of fire (Please see videos). The diamonds are prong set in Rose Gold which compliments them perfectly.